Looks like a Sherman to me. Hope to actually finish it this time! Next stop, coming up with a base color mix and then painting all those TIRES! Not real original, but gets the point across. What do you all think? Couldn't we add an armor branch insignia in there? Nice suggestion. That works for me. I'm certainly willing to go for that! I'd say that nails it. 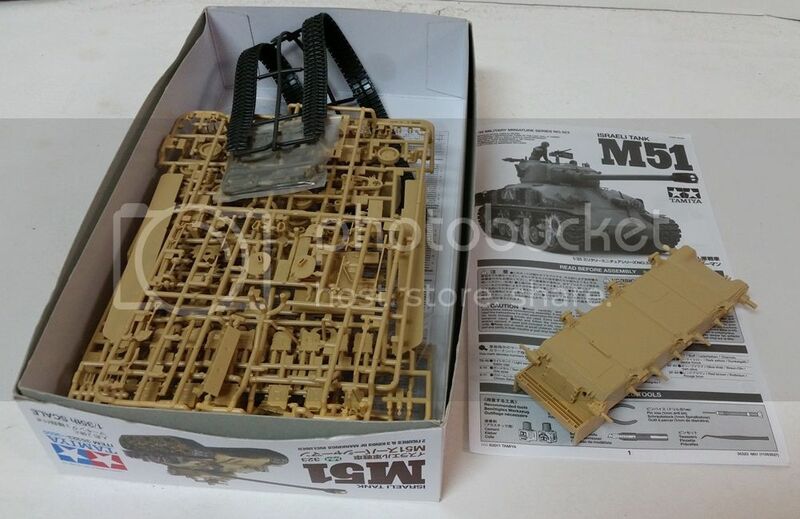 Looking forward to your build, Michael, I have one of these slotted for the Six Day War Anniversary Campaign! 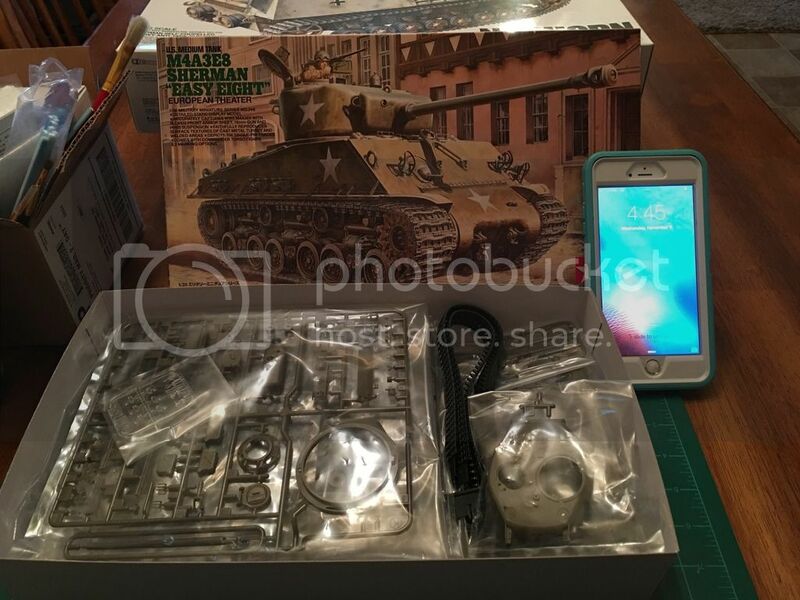 Academy M3 Lee kit, I got a later issue with the corrected parts. There's even an insert in the instructions telling you to use the new parts. Just a little aftermarket. The later bogie covers are from the Academy M7 Priest kit, TMD exhaust and air filters and a Tamiya figure. For some reason I like the old figure from the Tamiya Lee lit. Photographs show that some crews welded pieces of plate over the air filters. I have the the open and angled covers on other Lee kits so this one got the total cover. The resin fish tail exhausts on the modified rear plate. Just had to blank off the intakes for the unarmored air filters. The rear hull boxes are the wrong size. I'm lazy so I just took the set leftover from my Tamiya Grant and modified them to the right size. They're only a little too short. The hull rear overhang is not long enough to fit the armored air cleaners so I extended it out. I think it's a fault with the kit but matching parts up to scale plans is approximate for me on good days. And where she is as of this post. I added the counterweight on the 37mm as the version i am doing had it. I also used solid road wheels instead of the spoked as some Lees had them in Tunisia. I severely chunked the rubber on two spoked road wheels and put them in non crucial parts of the suspension to indicate the changeover the crew had made over time. I've already shortened the tracks by a link and lazy that I am stapled them together. I wrestled with the fit of the air cleaners and then the freaking hull so by the time I got to the tracks... staples were all I could stand to do. Yes the multi part hull fit in the fit is bad. 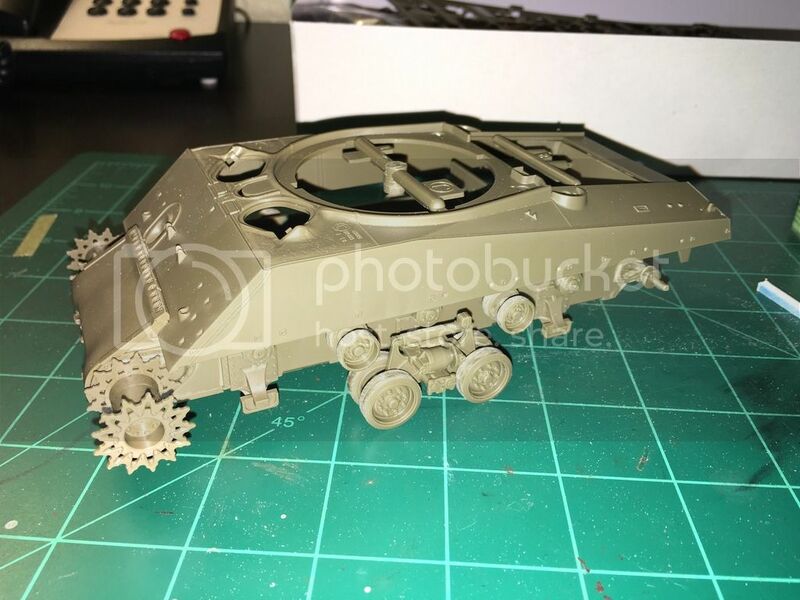 Do not do it all as one big assembly as they would have you do, but glue it on the lower hull in parts, dry fitting constantly. Even doing that I still ended up with issues on the hull rear. Just a quick update. Camera batteries are dead so no photos this time. I'm making slow progress. 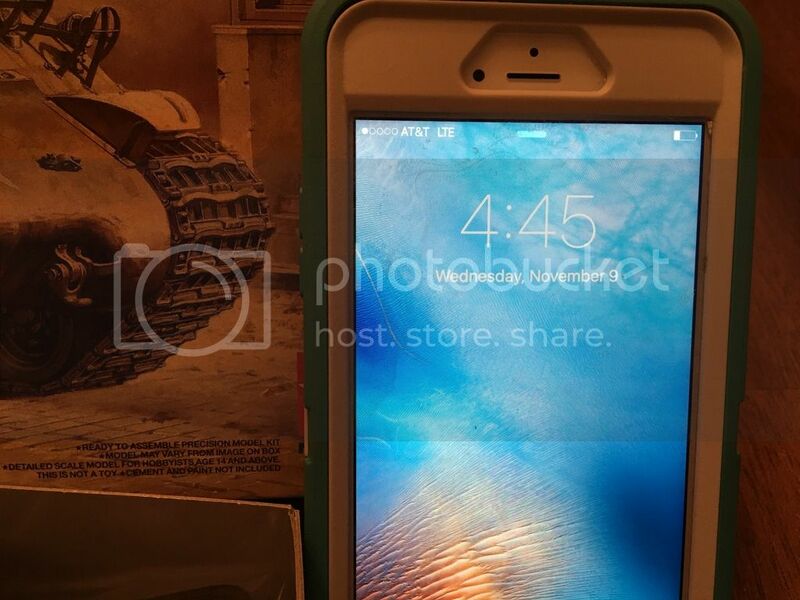 I've tried a correction to the curved back plate that doesn't look too bad. I still need to replace the tie-downs. I have found very few photos of Marine tanks with stowage some I've also got the rivets removed from the hull. I still need to do some work on the front plate that the driver/gunner visors are hinged to adjust it to M3A1. I've decided not to use the TWS turret. The canvas covered gun barrel is only half as long as the kit barrel. Anybody else run across this? I'm going to use the old white glue and tissue trick to make the cover. Plus I wanted the hatches open and it was going to be major surgery as the gun and breach are all one piece. Steve, I really like how that Lee is coming out. I want to tackle one myself some day. With little stowage I'm going to maybe use some tools or tree branches to cover the rough spots on the back plate. How about Sandbags? I know on Shermans they'd pile them on the rear deck because the Japanese liked to create havoc back there. I finished my M3A1 Stuart just before this campaign started. Did it as one of the Russian ones. I got the decals on the Lee still waiting on uploading pictures. I intended to put some figures with it but I think I will hold off until my recovery from cataract surgery is complete. I can see close to build and basic painting but not fine stuff like figures. Hi fellas! 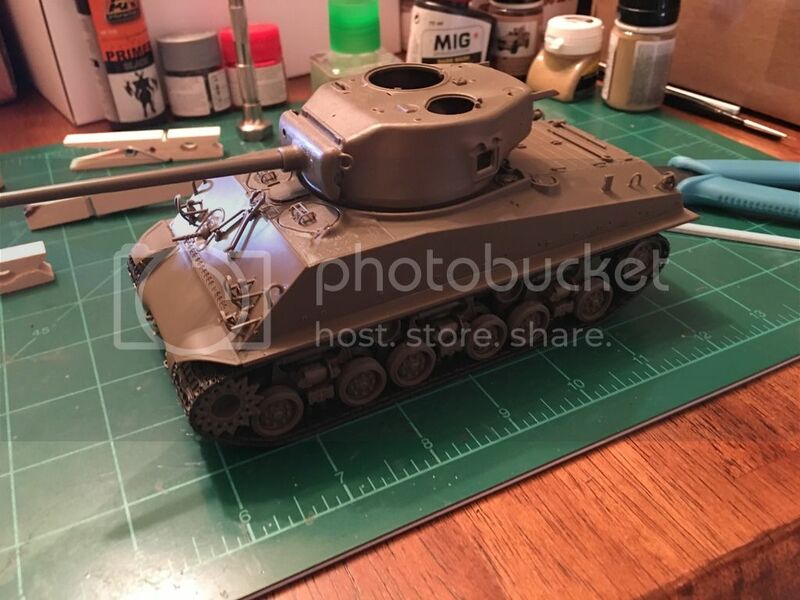 If it's ok I'll enter with this Tamiya Sherman M4A3E8. Sounds like a plan to me Dustin! I've been wanting to build that Easy 8, looking forward to your build, Dustin! This kit is very nice! No way this can be my first and last Sherman! I made a tiny bit of progress. Thanks for the idea about sand bags. I may give that a try and see how it looks. I'm trying to stay as true to the photos of the actual tank as I can. What did you do about the headlight lenses on your stuart build? I don't think paint the dark green plastic silver is going to be very realistic. It's hard to tell from the photos whether the lenses were painted over or just glass. 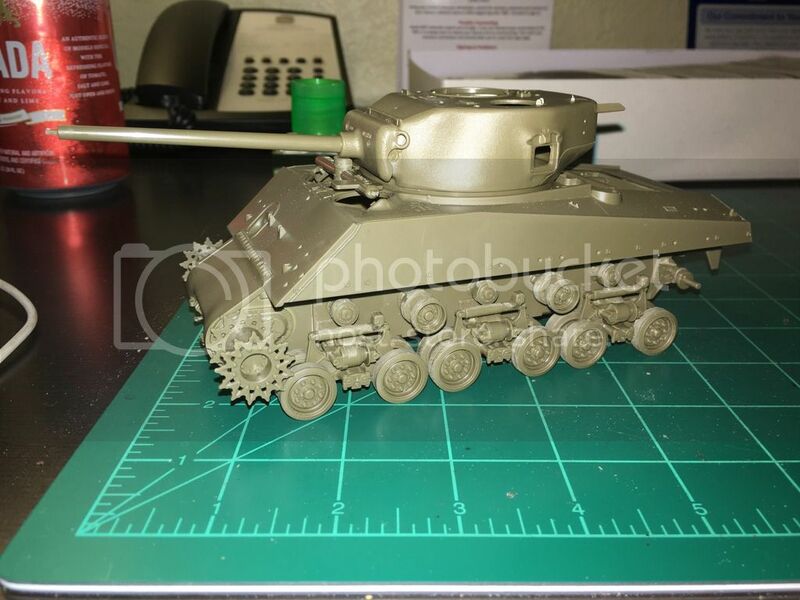 I've found a several photos showing marine tanks, both stuarts and shermans just having clear glass headlights. Hope to have some more photos up soon. All the running gear complete. Now to work on the upper hull and turret. 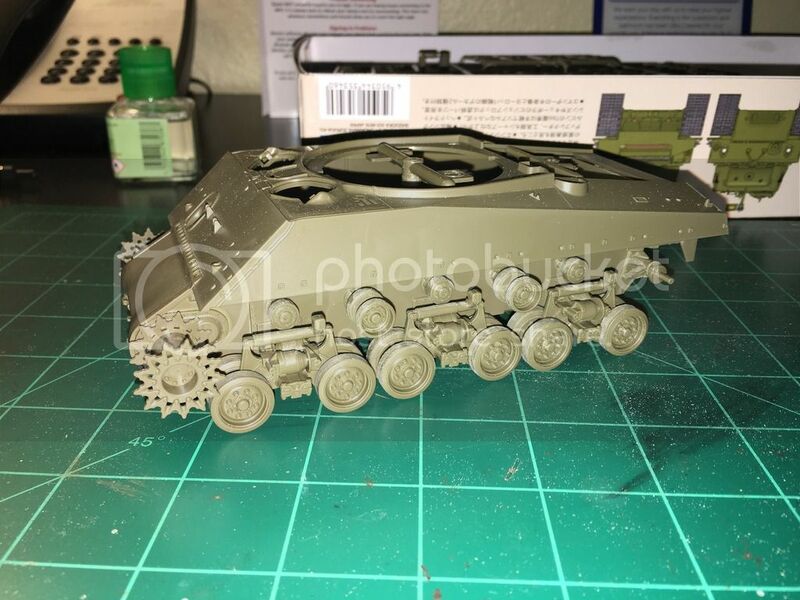 Looking like a Sherman now.